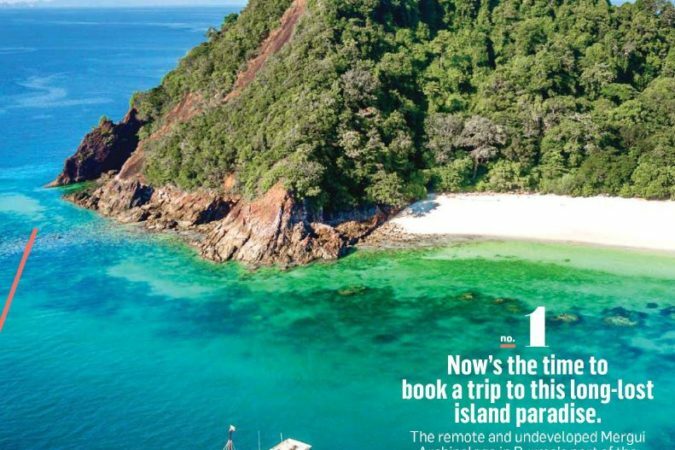 The remote and undeveloped Mergui Archipelago in Burma’s part of the Andaman Sea has more to offer than just a cruise from afar. As the government begins to hand out more hotel licenses, a few new resorts now offer island stays to help explore this pristine region. Go now, before the word gets out. SCATTERED LIKE UNCUT JEWELS across the Andaman Sea off Burma’s southern coast, the 800 islands, atolls and coral reefs of the Mergui Archipelago form one of the least-visited marine destinations on earth. The thickly forested islands, most blissfully uninhabited, are rimmed by crystal beaches and striking rock formations. Stilted fishing villages, shifting settlements of indigenous Moken or “sea Gypsy” families, and a few Burmese naval camps occupy only a handful of plots of land. Such isolation means the archipelago harbors a great diversity of flora and fauna, still largely uncatalogued, and some of the finest diving in Asia. Until recently the Burmese government zealously guarded this living treasure, allowing only registered liveaboard boats to cruise through – no overnight stays on the islands allowed. However, since 2011 the government has granted licenses for the development of resorts on 12 islands, following the Maldives’ model of only one per island. So far four are open and operating, but only November to April, when boat transport from Kawthaung, a rustic port at Burma’s southernmost tip, is unhindered by seasonal monsoons. The best diving conditions occur December to April, with whale sharks and manta rays visiting from February to May. With 10 spacious bungalows hidden well behind the natural tree-line on Nga Khin Nyo Gyee Island west of the archipelago, Boulder Bay Eco-Resort (boulderasia.com; doubles from $140 per person) provides a model for low-impact development in the region. A solar farm powers the lights and Wi-Fi while water is pumped from a local spring. Trails venture through tangled island forest to five pristine coral-fringed coves around the island, as well as a bamboo forest and Eagle Rock viewpoint. 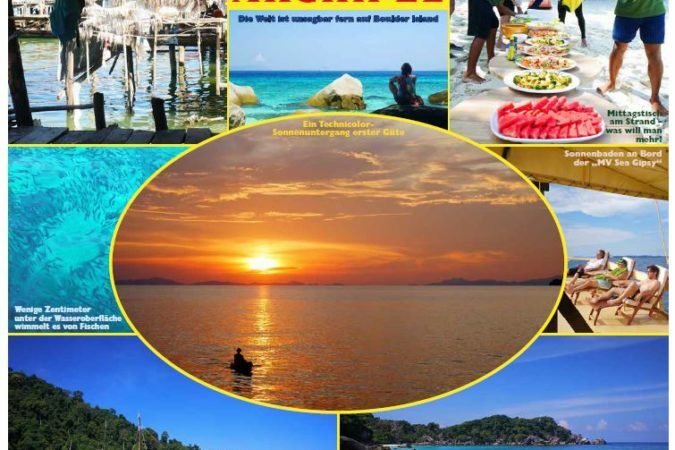 Meals boat transfers and the use of snorkeling and kayaking gear are included in the tariff. Photography (expeditionsinphotography.com) tours of the archipelago. Further north, Wa Ale Island Resort (waaleresort.com; double from $500 per person) occupies the rugged south shore of Wa Ale Island, adjacent to Lanbi Island, home to Burma’s only national marine park. Eleven luxury tented villas line one-kilometer Turtle Beach, named for the giant sea turtles whose nests are protected by the resort. Past a rocky headland from Turtle Beach, a smaller cove harbors two treetop villas made from recycled timber, and the resort’s rustic yet elegant dining area. Chef Ray Wyatt, a veteran of African safari camps, whips up an ever changing menu using fresh produce from the resort’s garden and sustainably caught local seafood. The resort’s resident naturalist doubles as a guide for treks and kayaking. Two hours by speedboat from Kawthaung, another barefoot luxury resort, Awei Pila (aweipila.com; doubles from $750), opened last month on Pila Island with 24 air-conditioned tented villas fronting a white-sand beach, open air restaurant, spa and pool. Pila Island features a small village with a Buddhist temple and a beach-shack bar with pool table. Awei Pila is connected to Burma Boating (burmaboating.com), a cruise fleet that includes luxury yachts for multi-day island explorations. If you need to stop in Kawthaung, Victoria Cliff Hotel & Resort (victoriacliff.com; doubles from $84) has Cliffside villas with views of the Andaman, while Grand Andaman Hotel & Resort (grandandamanisland.com; doubles from $93), famed for its relatively upscale casino, is on Thahtay Island, a short boat ride from the port.